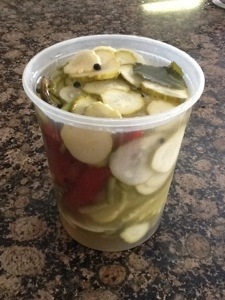 A CSA customer recently asked for pickling advice. So we decided it was time to write out a full answer. Firstly, you’ll want to decide if you’re going to be canning or making fridge pickles. Canning has extra steps involved, but makes sense for larger batches, longer storage time, or if fridge space is limited. I won’t include much canning advice, except to say that if you’re new to puttin’ up jars of summer veg, hot pack pickling recipes are a great, un-daunting gateway into canning. Also, we have found that canning is most satisfying and efficient when you can do lots of it at once. So we when we can pickles, we might take half a day, and do dozens of jars of various hot, sweet, and dill cucumber pickles; in addition to all the peppers, okra, summer squash, chard stems, beets, green tomatoes and anything else you can imagine pickled. This way you can economize with one hot water bath, only a few pickling liquid recipes, and you can make it a fun event with friends. 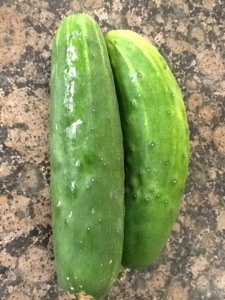 Here is our basic spicy cucumber refrigerator pickle recipe. My philosophy is that most recipes, and especially pickling recipes, are rough guidelines. You can adjust the spiciness down or up with different types and quantities of peppers. And you need not make a special trip to the store just for fresh thyme or one of the other spices; the flavor won’t be greatly affected by their omission. That said, we like this pickles we’ve made from this recipe a lot. 1 medium head of garlic, whole cloves, peeled. Put liquids, salt, sugar together. Stir till mixed. Warm water may help with that. Add everything else. Cut cukes however you like. Just make sure the stems aren’t on there, as it can introduce an unpleasant bitterness. At this point, you may can them if you like, following a reputable canning recipe (usually this includes, at a minimum: a simmered brine, 10 min hot water bath, & new lids), or just leave them in the fridge for a few weeks, up to a few months. Try them in 3 – 4 weeks to see if they are ready. Try this recipe with other veg, like okra, young squash, or peppers. Or tweak it some as you like.